A day after the Meralco Bolts’ Jimmy Alapag surpassed his total for three-pointers in a career, Allan Caidic, the previous owner of the record said that he was fine with the former’s feat. 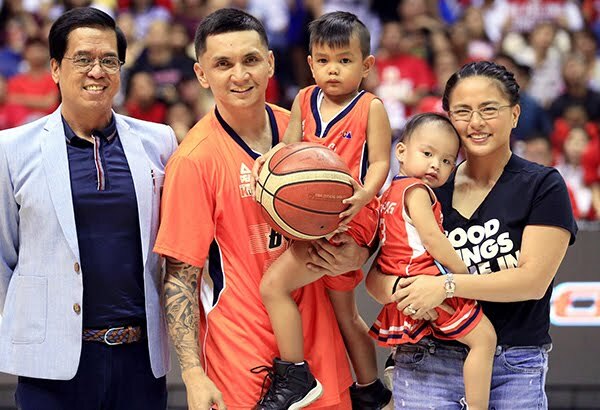 Alapag broke the 17-year old record when he drilled the 1,243rd triple of his career during Game Two of the current Governors’ Cup Finals between Meralco and the last club that Caidic played and coached, Barangay Ginebra. At that time the three-point shot wasn’t in existence locally despite the field goal being introduced in the now defunct American Basketball Association during its 1967-68 season and in the National Basketball Association during the 1979-80 season. The three-point shot was officially allowed in the Philippines in 1984. During the 2010 NBA All-Star Challenge where former PBA players got to play alongside NBA legends such as Gary Payton, Glen Rice, Chris Webber, and Mitch Richmond, Caidic hot 14 treys in a scintillating performance that had the Americans in awe. “Kahit exhibition game lang yun, highlight din yan kasi naipakita ko kung ano kaya ng Pinoy,” recalled the Triggerman who finished with a game high 54 points in only 24 minutes of play. Despite losing the three-point record to Alapag, Caidic still holds 18 other individual records in the PBA.